The results of a material cost estimate with quantity structure do not differ from one without a quantity structure; they are identical from a costing point of view.  Cost component split. This means that the valuation principles outlined in earlier units also apply here. It is only the method by which the costing results are obtained that is different. 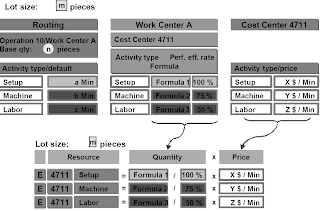 Material costing with quantity structure can determine the product structure and production plans as entered in Logistics, and convert them into the structures of the itemization and cost component split. n This explains the emphasis on describing the logistical data.In addition, Activity-Based Costing is briefly covered. Finally, this unit describes the price update process after the execution of a standard cost estimate. in Material Requirements Planning for procuring parts. in Production for staging parts. in costing for calculating material costs. 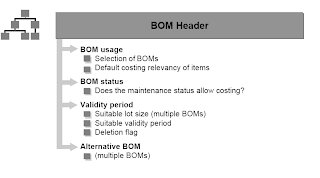 The BOM header contains information that applies to all items in the BOM.The BOM status must be active for costing to enable the BOM to be read for a cost estimate.The above slide lists the fields in the BOM header that are relevant to costing.BOM usage: Examples for BOM usage: BOMs used exclusively for engineering or costing purposes. the BOM is used, such as for a cost estimate. 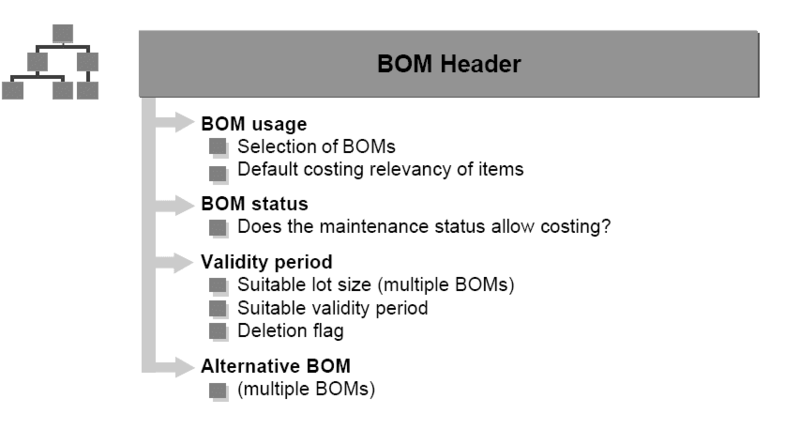 one BOM can be used for the defined costing lot size. Fixed quantity indicator: This indicates whether the quantity entered is dependent on the lot size. It applies mainly to unavoidable material loss at the start of the production process.Planned scrap: This topic is covered in detail in the appendix under Scrap. Relevancy to costing indicator: If this indicator is not selected, the system ignores the BOM item in the material cost estimate. For standard cost estimates, modified standard cost estimates, and current cost estimates, the only decision to be made is whether or not the item will be costed ("X" or " "). For inventory costing, a relevancy to costing indicator can be entered here that has a devaluation factor in Customizing. This enables you to devaluate BOM items (such as packaging materials) on a flat-rate basis for inventory or commercial purposes. The settings in the BOM usage and BOM item categories allow you to specify whether this field contains a default value and whether this value can be changed when the BOM is maintained. n Bulk material: Bulk material is usually posted as consumption at production cost centers as soon as it is procured, so it is not included in the cost estimate. Nonstock materials are materials that are not kept in inventory. They are always procured externally and assigned directly to the order. Nonstock materials have either no material master, or are maintained with a nonstock material type for the entry tool.For nonstock materials without a material master, data that is relevant to costing (such as prices) is entered directly in the BOM item (purchasing data).  For nonstock materials with a material master, no prices can be maintained and the materials are valuated in accordance with the strategy specified in the costing variant. The price shown in the BOM does not have to be the same as the price in the cost estimate selected in accordance with the valuation strategy. Production costs are determined through the routing, the work centers at which the operations are performed, the cost centers and the relevant activity types.A routing consists of one or more operations. Each operation contains information on the work center, production resources and tools, material assignments, operation texts, and standard values (how long, how much).For repetitive manufacturing and process manufacturing, rate routings and recipes can be used. Work centers are used in plans (routings, networks, inspection plans, maintenance task lists, and rough-cut planning profiles).Machine group and capacity planner group are synonyms for work center. Work centers are defined with reference to a plant. Work centers are assigned to cost centers. Dimension (time, quantity, volume, and so on) in which the standard values must be maintained.  At the same time, the parameter key represents the names of the formula parameters. You can use the formula parameters to represent the standard values in a formula, so as to determine the following: execution time, capacity requirements, costs. Costing: This ensures that the operation is included in costing. Confirmation: Here you specify whether and how the operation is confirmed. External processing: Here you specify whether the operation is processed internally or externally, or whether both options are possible. Material - plan assignment: A routing can contain multiple materials that are involved in the same production process.You utilize a task list usage to assign the routings to various work areas. In this way, you can create several routings to produce one plant material. These routings are differentiated in your task list usage. Routing status : You use this status to indicate the processing stage of a plan. For example, you could indicate whether the plan is still at the creation stage, or whether you have already released it. If the reference indicator is turned off in the work center, you can overwrite the standard values of the work center in the routing. Linking the standard times with the activitiy types is carried out via the formulas in the work center. Production costs are created by combining data from Production Planning with Cost Center Accounting/Activity-Based Costing.The routing describes the quantity of an activity and the location of the operations. The work center describes where an operation is performed.It is linked to a cost center to valuate the activities. 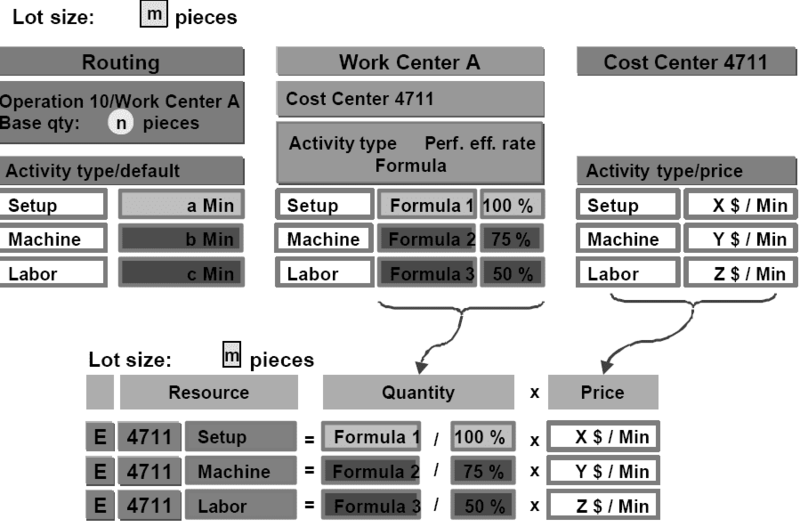 The planned activity prices for the work center are calculated through the link to a cost center and the activity type planning for the cost center. Formula: You can use formula parameters to which you have assigned values. You can then link these parameters with mathematical operations such as addition, subtraction, multiplication, or division. The system calculates the costs by multiplying the quantity by the price. The quantity comes from the standard values for the operation and is modified by the performance efficiency rate and a formula.In the itemization for the cost estimate, an internal activity for the cost center/activity type is displayed. Furthermore, the assignment to the operation and work center is saved in the itemization.